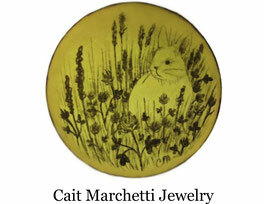 Cait Marchetti is a New England illustrator and jeweler specializing in enamel. She received her BFA in Jewelry and Metals and her minor in Drawing from University of Massachusetts Dartmouth in 2015. A few months later, she founded Cait Marchetti Jewelry and began selling her enamel jewelry part time. Her work was very well received and so she began selling online, to shops and attending festivals regularly in May of 2016 full time. She comes from a family of gardeners who instilled in her a love for the outdoors and capturing its essence on paper and in enamel. 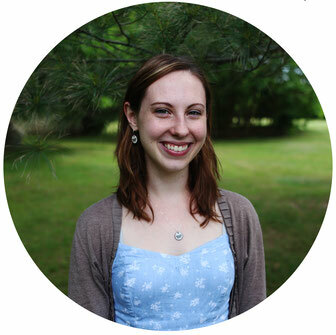 Since childhood, Cait has harbored a passion for drawing as well as all types of art. She was originally accepted into the College of Visual and Performing arts program at Umass for painting. She quickly realized she enjoyed everything else as well, and shortly after fell in love with the detail and precision that could be achieved in Jewelry and Metals. Cait continued to draw, pursuing a minor in Fine Arts, and looked for ways to incorporate her drawings, and color, into her jewelry. Through a process of firing graphite into enamel, she was able to create wearable small-scale meticulous drawings that were forever preserved in glass. Most of her senior BFA work was based on medieval literature with imagery that captured the highlight of each narrative. Many of her current pieces have narrative elements, and many designs seek to capture potential and growth, such as the Potential Series. The series features flora and fauna with one design on the back featuring an organism in an early stage of life, and on the front is the potential outcome if the same organism is allowed to flourish in its environment. An offshoot of the Potential Series is the Habitat Series, in which the designs feature an animal in its habitat on the front, and its habitat without the animal on the backside. It leaves a haunting presence of the animal, the habitat is the same as the front side, as though the animal has left the scene. Though the artist occasionally will release designs with subjects not native to New England, Cait prefers to sketch and draw inspiration from life, and so many of the featured species are native to her area. Her designs are a tribute to the critters and flowers that brighten her day.